Ashley believes therapy can be beneficial for everyone in some way. Whether you have a specific problem in mind, or are looking to build more self-awareness, therapy can be a transformative and empowering journey. Ashley encourages clients to be curious, using self-exploration to bring deeper meaning and understanding to their lives. Ashley places a strong emphasis on the therapeutic alliance, working to foster a safe, trusting, and non-judgmental environment. She believes collaboration between the client and therapist is an essential tool for creating change and supporting the client’s evolution into the most authentic version of themself. Ashley recognizes each person presents with a unique perspective and set of challenges to address. No single approach to therapy fits for everyone. Each client is greeted with empathy and understanding, allowing clients to determine how to best utilize their time in session. Trained in psychodynamic theory, Ashley draws from additional evidence-based practices such as cognitive-behavioral therapies, motivational interviewing, and mindfulness-based interventions. Ashley works with individuals, couples, and groups with a focus on examining how early childhood experiences and attachment contribute to behaviors and patterns clients may currently exhibit. 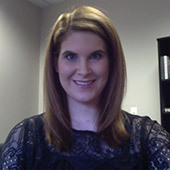 Ashley earned a Master of Arts degree in Counseling Psychology from Northwestern University. Since graduation, she has completed additional training in the areas of suicide prevention, Critical Incident Stress Management (CISM), Mindfulness-based Stress Reduction (MBSR), and the influence of psychological trauma on substance use disorders. Prior to joining Symmetry Counseling, Ashley worked in a community mental health agency and an Employee Assistance Program (EAP). She actively maintains her connection to Northwestern University by serving as Reflective Practitioner Supervisor for first year Master’s students in the online counseling program.